It's another storm day! 8 inches has fallen overnight at Turnagain Pass and we could get another 20-30 inches in the next 24 hours. The avalanche danger will start this morning at CONSIDERABLE and rise to HIGH as the day progresses and snow builds. Yesterday we saw very little natural avalanche evidence from our Monday storm, which dropped 2 feet at the Pass, but collapsing of the snowpack was frequent when breaking trail. All the new snow from this week is poorly bonded to the February crust layer. With a lot more snow forecasted today, avalanches could be breaking 4 feet deep to the crust, making them unmanageable and dangerous. Safe travel today will require staying away from all avalanche terrain, including runout zones. Turnagain Pass is again OPEN to snowmachines. The recent storms have provided enough snow cover to prevent resource damage. There are 2 interfaces in today's snowpack that may act as sliding layers. They can be separated out by the 2 storms we've seen this week. Storm snow that started falling last night may slide at the old surface layer we were skiing on yesterday. Yesterday we had a sunny break in the weather that built sun crusts on southerly aspects. With new snow building, this could become a sliding interface. This morning the new storm snow is less than a foot deep, but is expected to reach closer to 2 feet by the end of the day. Monday's storm fell on the old February crust, which has some buried surface hoar acting as a weak layer above the crust. Yesterday we experienced frequent collapsing (whumphing) on this layer at elevations between 1000 and 2500 feet. Some avalanche activity on Tuesday was reported up to 2 feet deep from this storm. A worst case scenario today would be avalanches that slide 3-4+ feet deep at the crust interface. This would include snow from both storms this week. 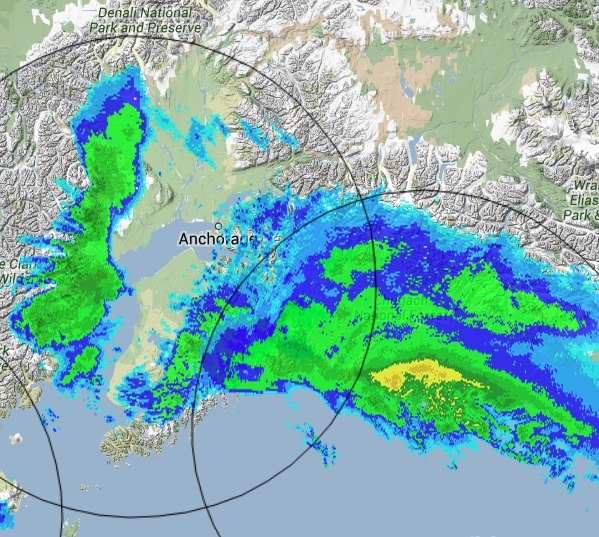 The storm that ended Tuesday dropped about 2 feet of snow in Girdwood and Turnagain Pass. That snow transitioned to rain at lower elevations at the end of the storm. This morning, Center ridge weather station has already recorded about 9 inches of snow and up to 0.8 inches of water equivalent. Sunburst station saw wind gusts to 105mph overnight from the East. Snow/rain line is predicted to stay at sea level today, but temperatures are right on the threshold. Some rain is possible at sea level. Snow above 1000 feet is expected to reach 11-16 inches today and another 9-14 inches tonight. An east wind will stay strong while this storm continues.